Improving the customer experience, building lasting customer relationships, and driving customer referrals is a critical part of growing a business. If you just swap out ‘customer’ for ‘donor’, the same applies to nonprofit fundraising. With social media, a nonprofit’s number one customers are cause evangelists. These influential donors are more important than ever because of how far and wide their positive endorsement can reach. Nonprofits must invest the time and energy into creating and nurturing cause evangelists. In fundraising, these donors can become critical segments to drive engagement, find new supporters, and grow your cause. Cause evangelists are more than just loyal supporters or repeat donors. Evangelists are connected to more than just your organization – they’re connected to your mission and what you’re charitable presence stands for. Nonprofit teams can rely on evangelists to recruit new donors, volunteer, and be a sounding board for new ideas. This makes them active supporters in promoting or directly fundraising for your cause. Nonprofits with great evangelists are constantly asking for feedback and ideas, and they are actively implementing feedback into their donor experience. The focus is worth it, as evangelists will become outspoken advocates for your cause. Creating evangelists doesn’t happen overnight. Even your most loyal donors need a little nudge, and requires help to deepen their connection with your fundraising. One of the most critical driving forces for any cause evangelists is what the organization stands for. 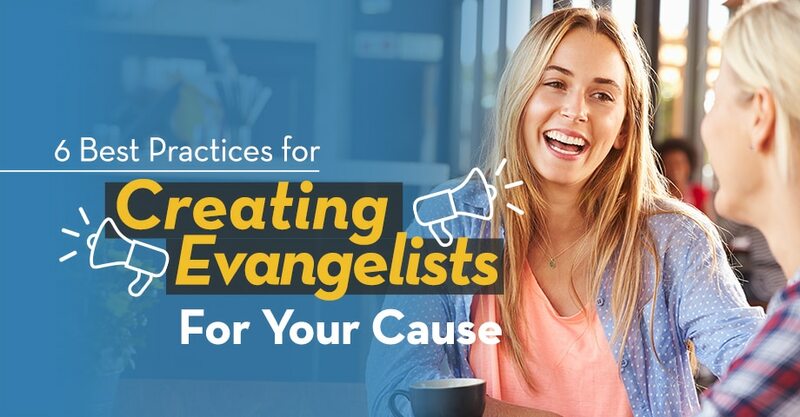 Evangelists connect deeply with the mission and purpose of a charity, making it crucial that nonprofits refocus their donor messaging and branding around their why. For some nonprofits, talking about a ‘brand presence’ is a foreign concept, but your brand is just as important in the nonprofit world as in the for-profit world. It’s the combination of your message, your mission, your purpose, and the way you voice this value to the world. Run a social media campaign to target new evangelists. Highlight success stories and showcase how your team is using donations to make a difference. Include links people can click if they want to become involved or to learn more. Another trait of cause evangelists is that they want to help improve the success of a nonprofit organization. Going beyond donations, evangelists want to be involved in a variety of activities. To create lasting experiences with your evangelists, set up think tanks, volunteer groups, or even casual coffee meetups with people who are passionate about your cause. Use these opportunities to deepen their connection to your cause. Set up meetings with a few key evangelists. Ask them for ideas and feedback to help improve the donor experience. As a nonprofit, your team is considered ‘subject matter experts’ in your field. It’s your responsibility to be a thought leader in this space and share your knowledge with others. Evangelists are attracted to compelling content that highlights the value of an organization and how it is making a difference. Create a variety of different content (blogs, research studies, newsletters, social posts) from a variety of different authors to keep your brand fresh and new. Ask your current evangelists and biggest supporters to contribute content to your blog. This will humanize your cause and share stories about why people are getting involved with your team. Think of all the conversations happening both in person and across online channels. This is considered ‘buzz’ and it’s the perfect place to create and nurture evangelists. Creating an online presence gives your evangelists a place to go when they want to talk with other people who are invested in your cause. It opens up new channels of communication and helps build a community (more on that in a second). Create a unique hashtag across your social channels for an awareness campaign. Aggregate all of these mentions in a single place so people can see what others are saying and start conversations. Just as is the case with for-profit customers: social proof is important to attracting new evangelists. people like to know that they belong to something bigger than themselves. When it comes to finding potential evangelists, start with your community. Identify top volunteers, donors, or people who attend are faithful attendees to your fundraising events. These fundraising ambassadors can be true evangelists for your cause. Host intermittent ‘community meetups’ throughout the year separate from your scheduled fundraising events. These provide a chance to connect with potential evangelists. Most supporters don’t want to jump in with both feet without knowing how deep the water is. Build your evangelist nurturing process with bite-size chunks that give people a way to get familiar with your organization. Evangelists should want to become involved with your organization because it’s fun, engaging, and fulfilling – not stressful. Create a tiered engagement model for evangelists with different time commitments. Give people the chance to join committees volunteer, or participate in campaigns. Ambassador fundraising: As mentioned earlier (but worth repeating! ), ambassador campaigns line up perfectly with the goals of nonprofit evangelist programs. In this case, evangelists would serve as Ambassadors who would be given the tools, resources, and technology they need to go out and fundraise for a nonprofit on their own. With individual giving pages, content, and audiences, these Ambassadors serve as ‘faces’ of a nonprofit to drive engagement and donations. P2P campaigns: While evangelists are often word-of-mouth nonprofit marketers, P2P campaigns provide the perfect social fundraising outlets. Evangelists are the perfect people to kick off P2P campaigns and persuade other people to join in the fun. P2P campaigns rely on people’s social networks and word-of-mouth engagement, making them a great way to kick off your evangelist program. Awareness campaigns: While awareness campaigns themselves revolve around a larger cause campaign, individual nonprofits can host their own awareness campaigns with the help of evangelists. Once you have an idea for an awareness program (and a social media/promotion plan), your evangelists will be the first ones sharing and posting.